CHIȘINĂU, Moldova — A school uniform. A pair of pyjamas. Work slacks and a blouse. These are just some of the clothes that women and girls in Moldova were wearing when they were sexually assaulted, abused or harassed. 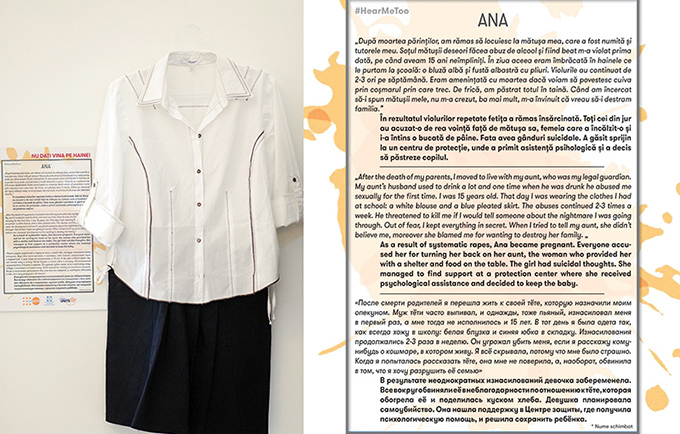 An exhibition of ten such outfits, accompanied by the stories of the survivors, aimed to combat stereotypes about sexual violence that are prevalent in Moldovan society. Six out of 10 women over the age of 15 in the Republic of Moldova will experience at least one form of violence — psychological, physical or sexual — from their husband or partner during their lifetime. Sexual violence is the third most common form of violence experienced by young girls and leaves serious marks on their lives. The exhibition, which was titled “Don’t blame the clothes!” and held at the Faculty of Law at Moldova State University in December, presented reconstructed outfits and testimonials from real women and girls who were assisted by the Women’s Law Centre, the Centre for Assistance and Protection of Victims of Violence and Human Trafficking, and the International Centre “La Strada”. The three organizations collaborated to put on the exhibition with the support of UNFPA and the Moldova State University Faculty of Law. The concept was drawn from the “What Were You Wearing?” Survivor Art Installation originated at the University of Arkansas in the United States in 2013. The organizers of the exhibition are working on a mobile version that can be set up at other educational institutions as well as brought to rural communities to generate discussion and break down stereotypes in order to combat sexual violence. The “Don’t blame the clothes!” exhibition was organized as part of the UN Secretary-General’s UNiTE to End Violence against Women global campaign and the annual 16 Days of Activism against Gender-Based Violence. A version of this story originally appeared on the website of UNFPA Moldova.